Stephanie Calamari joined VergesRomes Architects in 1997, as an intern architect. She earned her professional registration in Louisiana in 2005, and in 2008 she was named as a Partner in the firm. Recent projects include the $39 Million Southern University New Orleans Faculty and Student Housing, and several Plaquemines Parish School Board new School and Faculty Housing projects in Port Sulphur, Buras that total approximately $100 Million in construction value. She also assisted project teams for the Plaquemines Parish School Board’s Head Start facility in Belle Chasse, and the South Plaquemines Vehicle Maintenance Facility. Stephanie has gained relevant project experience in the areas of due diligence, permit coordination, zoning issues and zoning appeals. She has interfaced extensively with the U.S. Army Corps of Engineers, FEMA, and GOHSEP to facilitate planning and achievement of project objectives in hurricane recovery projects and projects requiring wetlands determinations. 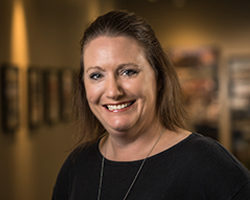 Stephanie serves as liaison to the firm’s Information Technology consultants to provide the VRA team with the latest software, hardware, network, FTP, BIM and digital rendering resources, and the appropriate training. Since 2001, Stephanie has been an active leader with Boy Scouts of America Cub Scout Pack 393 in New Orleans.